On a steep-sided, isolated ridge lying between the village of Benderloch and the NE shore of Ardmucknish Bay are the remains of a series of defensive works comprising two successive forts and a dun. The earlier of the two forts measures about 245 metres by 50 metres maximum width within a wall which ran round the margin of the summit area of the ridge. This wall survives practically throughout its length as a grass-grown band of stony debris in which five separate masses of vitrified material can be seen. The entrance was probably in the SE through the natural gully in that area. In the scrub-covered interior there are no indications of buildings. 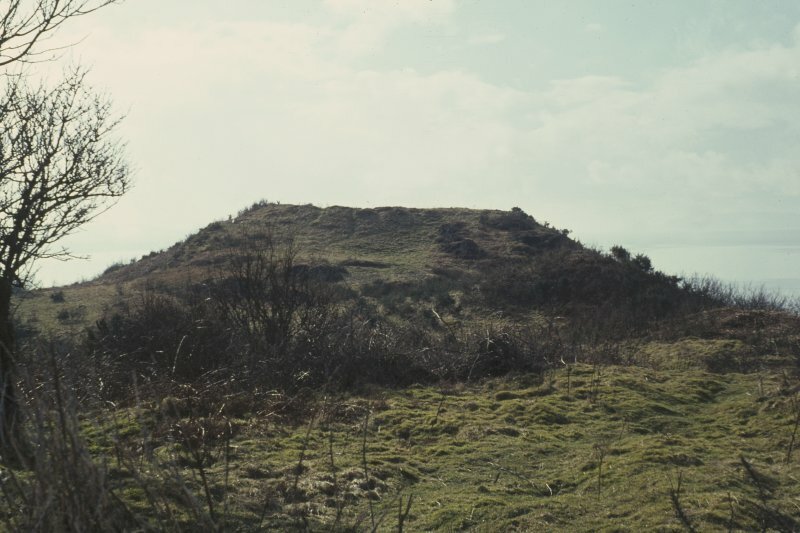 The later fort, situated near the SW end of the ridge, measures 52 by 21 metres within a wholly vitrified wall which overlies the earlier wall on the NW and survives as a grass-covered stony bank spreading to a width of up to 6 metres. On the SE side, a 7 metres stretch of inner facing stones is exposed. The location of the entrance is not now apparent. During excavation in 1873-4 (R A Smith 1872-4) several metal objects (eg a tanged iron sword, an iron dagger, an enamelled bronze circular mount) were found and are now in the NMAS. The dun is situated at the lower end of the ridge, in the NE, and measures about 18.3 by 15.2 metres within a wall about 3 metres thick. This wall survives as a grass-grown bank of stony debris. 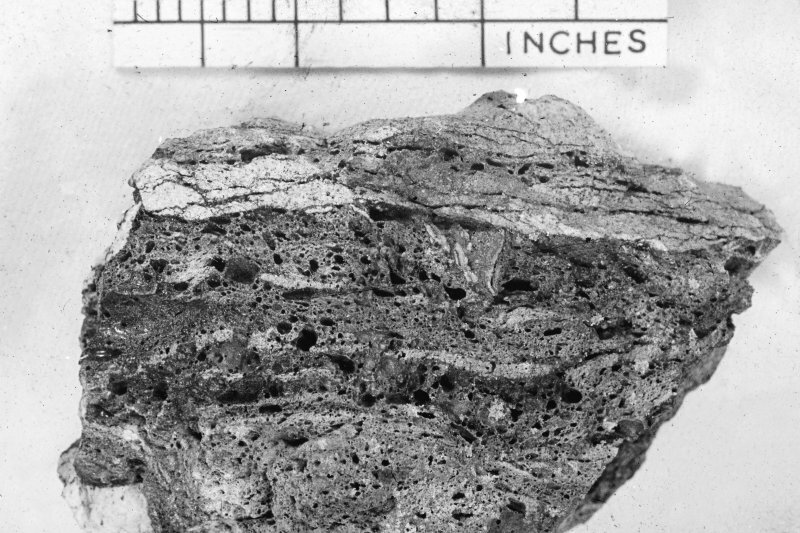 The removal of some of the debris on the east side revealed a vitrified mass of core material of the wall of the original fort. On the SW of the dun are the remains of two protecting outer walls running transversely across the ridge at distances of 9 and 18 metres respectively from the wall of the dun. Each of these outer walls has a centrally placed entrance, though no corresponding gap in the actual wall of the dun is visible, and the position it would occupy if in line with the other two is now blocked by four large earthfast stones. On the SE flank of the ridge, 6 metres outside the wall of the earlier fort, there is a cavity in the rock 1.3 metres square, and normally filled with water fed through a crack in the rock above. 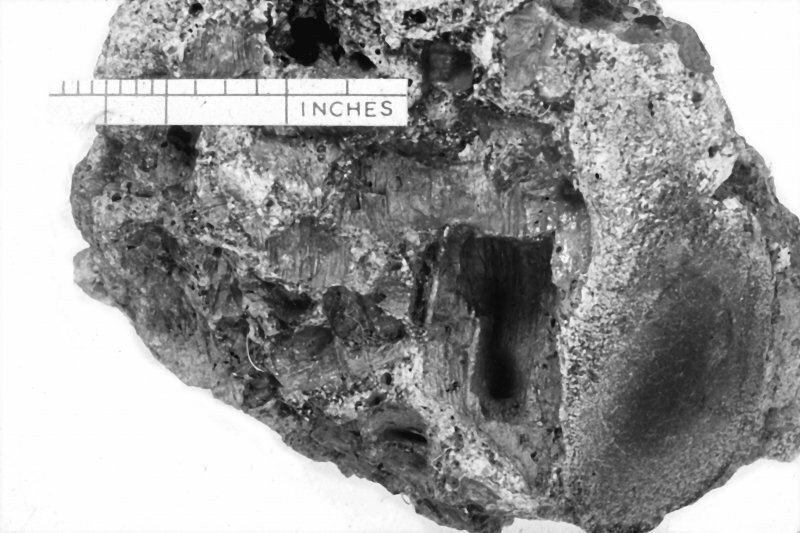 This cavity was originally a natural feature but was enlarged and deepened to provide a well. As described. The 'Stone Circle (Remains of)' on OS 6" 1900 Edition, and also shown on Smith's plan was mis-identified. It is, in fact, part of the dun wall. Visited by OS (DWR) 3 November 1971. 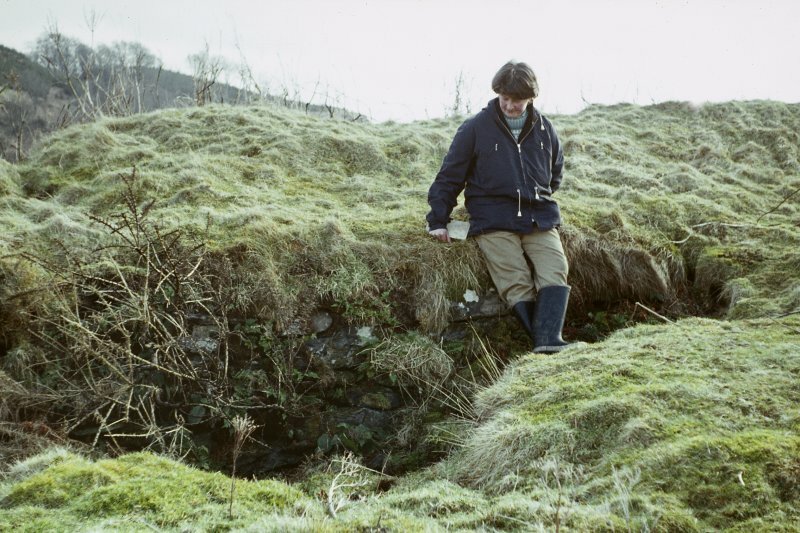 This fort is situated on an elongated ridge that rises from the edge of the shore to the NE of Benderloch Station. Steep slopes and rock faces extend round its flanks, and the easiest access is across the relatively gentle slopes at the NE end. The crest of the ridge is divided into two levels, the upper including the summit at the SW end, and the lower the rest of the spine extending out some 150m to the NE and contracting into a relatively narrow finger no more than 20m wide. The visible fortifications represent at least three phases of construction, the latest of them a relatively small enclosure measuring about 18m by 15m internally, which, along with two walls cutting across the spine of the ridge on its SW, occupies the crest of the narrow finger on the NE. These defences directly overlie the earliest fort, which not only takes in the whole of the narrow finger on the NE, but contours around the flank of the higher end of the ridge on the SW to enclose an irregular area measuring about 250m in length from NE to SW by a maximum of 50m transversely (0.75ha); reduced to a band of grass-grown rubble, RCAHMS investigators noted five separate in situ vitrified masses in its core. No certain entrances have been identified in its near continuous circuit, options being either at the NE end or in a broad gap at the head of a steep gully in the natural re-entrant formed by the topography of the hill on the E. This large fort is also overlain by a small fort occupying the upper, SW, end of the ridge. This appears roughly oval on plan today, but with a dogleg forming a sharp angle where it follows the line of the earlier wall on the NW side. Internally it measures 52m from NE to SW by 21m transversely (0.08ha) and though its heavily vitrified wall is reduced to a bank up to 6m in thickness, there is a run of inner face visible over a distance of 7m on the SE; the position of the entrance is not known. 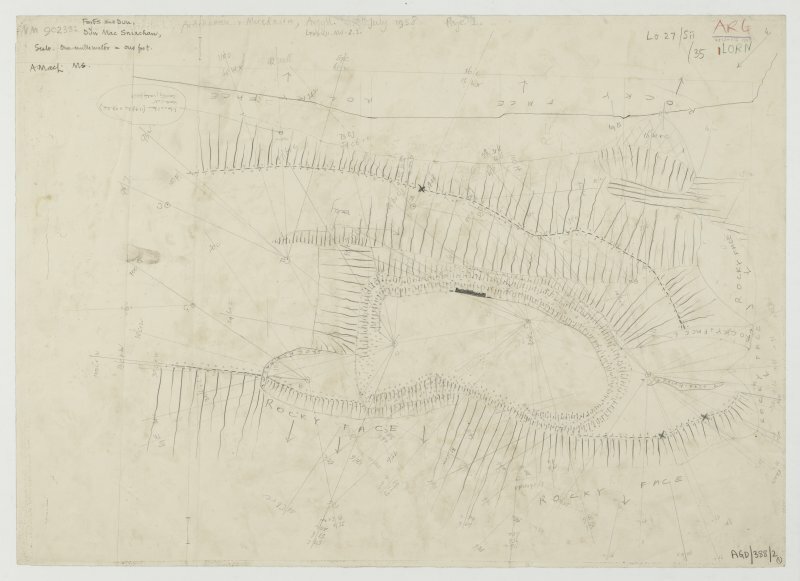 Robert Angus Smith carried out excavations in this small later fort 1873-4, revealing relatively deep deposits within the interior, and in a confused account describing what appear to have been rectangular structures at the NE end and a 'long passage' (Smith 1874; 1876; 1878). 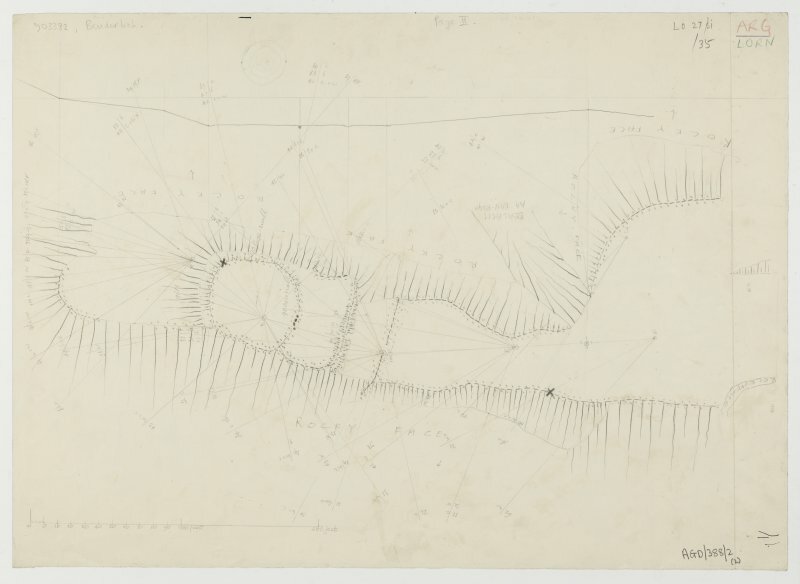 Contrary to what is visible today, his plan (1878 pl 1) portrays the line of the wall at the NE end in a regular arc, and he ascribed the dogleg to a later period of reconstruction in which pieces of vitrified stone had been incorporated into the core of a new wall on a different line. 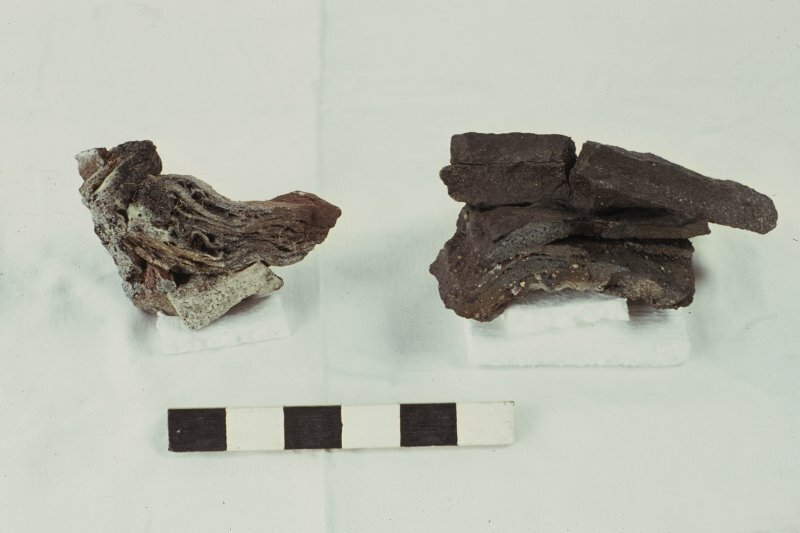 In the course of this work they found part of a tanged iron sword, an iron dagger, an iron ring, an enamelled bronze mount, a bronze ring and several quernstones, together with a quantity of animal bones.